Italian medium tanks Carro Armato M14/41 and M13/40. 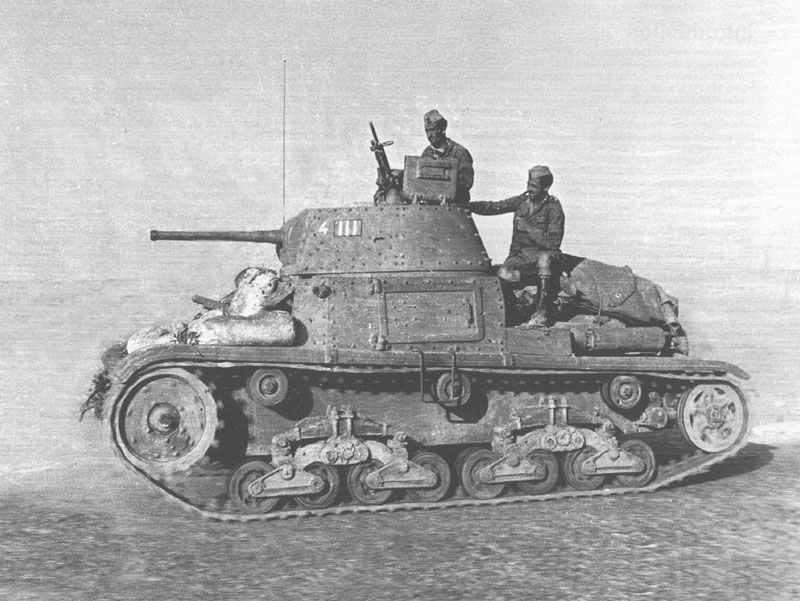 Carro Armato M13/40 in North Africa. The Carro Armato M13/40 had been the successor of the M11/39 (just 100 produced) and it was required for the Italian army in January 1940 and it was operating from September 1940 in North Africa. The M13/40 which in fact had an identical chassis similar to the M11/39 however a remodeled hull of riveted design ranging in thickness from 6 mm (0.24 in) to 42 mm (1.65 in). The driver had been placed at the front of the hull on the left with the machine-gunner to his right; the second handled the dual Modello 38 8-mm (0.315-in) MGs plus the radios. The 2-man turret was at the centre of the hull, employing the commander/gunner on the right and the loader on the left side, along with a two-piece hatch protection within the turret roof. Main armament made of a 47-mm 32-calibre gun with an elevation of + 20° and a depression of -10°; turret traverse was 360°. A Modello 38 8-mm (0.315-in) machine-gun had been installed co-axial with the main gun along with an identical weapon was placed on the turret roof for anti-aircraft defence. Totals of 104 rounds of 47-mm and 3,048 rounds of 8-mm (0.315-in) ammunition had been held. The power plant was at the rear of the hull, its power being transmitted to the gearbox at the front of the hull using a propeller shaft. Suspension on every side was made up of 4 double-wheel articulated bogies attached to a pair of devices every one carried on semi-elliptic leaf springs, with the idler at the rear; there were three track-return rollers. The Australians used for a short period captured Italian M13 and M11 tanks. Carro Armato M14/41s under fire at El Guettar in Tunisia, spring 1943. US troops inspect an abandoned Carro Armato M14/41 of the Centauro Armored Division in Tunisia’s Kasserine Pass during the spring of 1943. Two Italian tanks in the RAC Tank Museum, Bovington Camp, Dorset (UK): in front the small Carro Veloce Tankette and behind a Carro Armato M13/40 or M14/41. 3D model of Carro Armato M13/40. The M13/40 had been manufactured by Ansaldo-Fossati at the amount of approximately Sixty to Seventy tanks monthly, as many as 799 being manufactured. The Carro Armato M13/40 had been widespread action in the Western Desert by the Italian army but was cramped, turned out to be pretty unreliable operating and it was vulnerable to taking fire whenever hit by anti-tank shells. Numerous tanks had been taken by the British military right after being left behind by their crews and afterwards supplied to the British 6th Royal Tank Regiment (RTR) and the Australian 6th Cavalry Regiment at the beginning of 1941 while tanks had been in a really limited availability within the Allied units. The Australian regiment had 3 squadrons of taken tanks which they named Dingo, Rabbit, and Wombat. In order that they weren’t attacked by Allied soldiers, white kangaroos were displayed on the sides, glacis as well as turret rear. The Carro Armato M14/41 was basically the M13/40 equipped with a stronger diesel-powered power plant which was backed up with air filters developed to deal with the tough circumstances of the desert. Manufacturing came to 1,103 of these tanks, which had a comparable specification to the M13/40 besides a rise in speed to 33 km/h (20 mph) as well as in weight to 14.5 tonnes. Users: Italy, Germany (22 M13/40 and one M14/41 captured after the Italian surrender). Tagged 1940, italy, medium tank.